Thyroid, Parathyroid, Adrenal, Endocrine Surgery, What is negative feedback? This is a concept that applies to all endocrine systems. 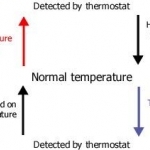 The principle is that of homeostasis, the maintenance of the body systems in equilibrium, and is best explained by the analogy of the thermostat in your home. If the room is too cold, the thermostat detects this and turns on the heating. The room then warms up. The temperature is prevented from rising too high because the thermostat detects when the optimum temperature has been exceeded and turns off the heating. This is negative feedback, and keeps the temperature constant in the house. An endocrine example is in the hypothalamo-pituitary axis. There is negative feedback of the pituitary hormone on the hypothalamus, preventing the releasing hormone from being released. For example ACTH inhibits CRH release. Similarly, there is negative feedback of the target-tissue hormone at both the pituitary and hypothalamic level. For example, cortisol from the adrenal cortex inhibits the release of ACTH from the pituitary and CRH from the hypothalamus, keeping levels of cortisol in equilibrium. Cortisol levels can never rise too high in the healthy state as the higher they get the more they inhibit the stimulation of cortisol production. Similarly they can never get too low, as the inhibition is removed and production of cortisol is stimulated.